By clicking "Buy with Autoship and Save" you agree to receive Hydroderm�s Original Age Defying Wrinkle Serum, at the discounted trial price of $59.95, a 25% discount off the retail price of $80.00 and free enrollment in the Hydroderm Rewards Program, and agree that your card will be charged $59.95 every 30 or 60 or 90 days (your choice!) from your initial purchase until you cancel, which you may do at any time with a toll-free call to our Customer Care Center. As a Hydroderm Rewards member you will receive a fresh supply of Hydroderm's Original Age Defying Wrinkle Serum every 30 or 60 or 90 days (your choice!) at the same 25% discount, FREE SHIPPING AND HANDLING on ALL future orders, and additional discounts on other Hydroderm products. CA residents will be charged sales tax. 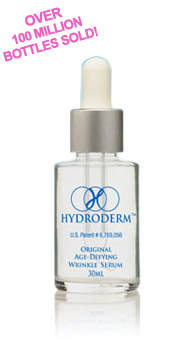 We take great pride in the amazing benefits of using Hydroderm regularly�softer, smoother, younger-looking skin. If, however, you are not completely satisfied, simply call our Customer Care Center toll-free for a Return Merchandise Authorization (RMA) within 30 days of your order date. If we receive your return within 10 days of issuing the RMA , you will be refunded in full for your order, less the cost of shipping and handling. You are responsible for return shipping and handling charges. By clicking "Try It Before You Buy It", You agree to be enrolled in the 30 DAY TRIAL of Original Hydroderm Age-Defying Wrinkle Serum, at the discounted trial price of $59.95, a 25% discount off the retail price of $80.00. At the time you place your order, you agree to only be charged a non-refundable Shipping & Handling charge of $6.95. We want you to have ample time to begin enjoying the benefits of the product�so you have 30 days from the order date to try it. After the trial expires, you will receive free enrollment in the Hydroderm Rewards Program and agree that your card will be charged $59.95 for the trial, and $59.95 every 60 days from your initial purchase until you cancel, which you may do at any time with a toll-free call to our Customer Care Center. As a Hydroderm Rewards member you will receive a fresh supply of Hydroderm's Original Age-Defying Wrinkle Serum every 60 days from your original ship date, at the same 25% discount, FREE SHIPPING AND HANDLING on ALL future orders, and additional discounts on other Hydroderm products. CA residents will be charged sales tax.